Lightening Colloidal Silver is the only Colloidal Silver product charged with extremely high voltage lightning. 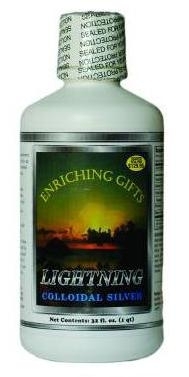 Enriching Gift's Lightning Colloidal Silver is made with environmental lightning voltage to ensure complete ionization of the silver particles. Lightning Colloidal Silver is made with environmental lightning voltage to ensure complete ionization of the silver particles. The only Colloidal Silver product charged with extremely high lightning voltage instead of household 110V or 220V electrical current. One ounce of Lightning Colloidal Silver contains over nine billion electrically charged positive ions of Pure Silver material. Purified deionized microfiltered water with ten parts per million of Silver mineral (99.999%). One ounce contains over nine BILLION electrically charged positive ions of Pure Silver mineral. Positive Silver ions, due to their small molecular size, are the best form for the body because they travel freely in and out of cells and extract electrons. Lightning Colloidal Silver ions are produced using powerful environmental lighting bolts, not with common 110 or 220 volt current. I have found through blood tests that my viruses and bacteria were significantly reduced (cut in about half) after taking one teaspoon each day for 15 days.